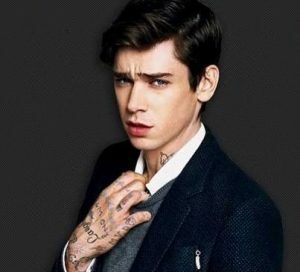 Cole Mohr is an American male fashion model who has worked for brands including Valentino, Barneys, Costume National, Marc Jacobs, Dior Homme, H&M, Burberry, Levi’s, Tommy Hilfiger, and Andrew Buckler. He has appeared in the editorials of popular magazines such as Vogue Italia and Japanese Men’s Vogue, GQ, Dazed & Confused, Tush, L’Officiel Hommes, i-D, and W Magazine. In 2009, he was named as one of the Top 10 Male Models in the industry by Forbes Magazine. Born Cole Michael Mohr on April 27, 1986 in Houston, Texas, he was educated at Bellaire High School. He moved to New York after signing with Request Model Management at age 18. Cole is one of Hedi Slimane’s favorite models to photograph. He dated Natalie Rodgers. *He was born on April 27, 1986 in Houston, Texas. *He’s signed with Request Model Management. *He became the face of Alexander Wang’s fall 2007 ad campaign. *He has multiple tattoos, including an “AprilMayJune” tattoo across his chest. *He’s friends with Nick Snider, Tasha Tilberg, Mina Cvetkovic, Luke Worrall, Freja Beha, Tyler Riggs, Emily DiDonato, Ash Stymest, Bastiaan Ninaber, Jeremy Young, Jethro Cave, Yuri Pleskun, Noma Han, Taylor Fuchs, James Neate, Alice Dellal, Josh Beech, Hanne Gaby Odiele, Eliza Cummings, and David Agbodji. *Follow him on Facebook and Instagram.